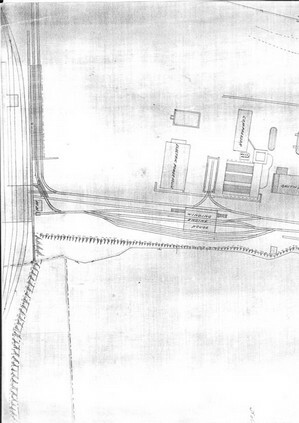 The 1899 map shows the site that the colliery was built on at a later date. 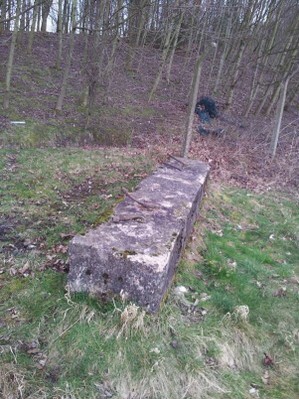 A mine using two drifts sunk in 1899 and 1927 into the Blackshale seam and possibly using the two old shafts of the Old Furnace colliery for further ventilation. In January 1908 the colliery was joined to Bonds Main underground and the colliery was thus part of the Bonds colliery network. 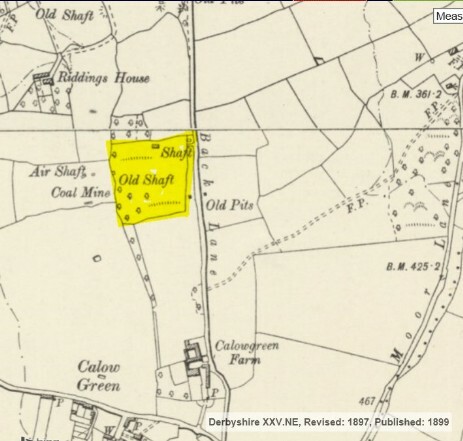 By 1897 the Staveley company had purchased land for 229 houses in 7 rows for a mining community to serve the companies collieries nearby and its railway partners constructions in the locality. 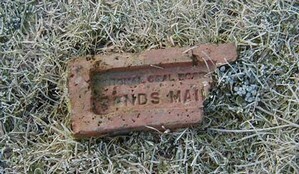 Mining communities had already been or were being constructed at Poolsbrook, Markham (officials and skilled workers) and Bonds Main by the company. The village of Arkwright was built throughout 1890’s to house the workers of the Calow and Bonds Main colliery and the local railway company. The mine exploited the Blackshale seam initially and the Deep Soft seam in the 1920's, the Staveley company owning the colliery until April 16th. 1927 when it was abandoned and superseded in the 1930's by Arkwright colliery. A branch line construction was started in 1899 and completed on 13th. May 1901, by the Lancashire and Derbyshire and East Coast Railway from a point about two miles from Chesterfield to the Calow collieries then belonging to the Staveley Coal and Iron Company Limited. 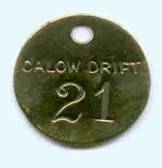 The Calow drifts were used for the ventilation and supply roadways for large machinery into Arkwright colliery until the roadways were superseded by a new drift at Arkwright colliery which was opened on October 7th. 1972. The drifts at Calow Main were fabricated in brick but succumbed to the rigours of time and by the 1960’s they were in a poor state of repair. On the site of the colliery one of the drifts is capped off and an inscription included which reads 'Mine Shaft Capped 2nd Nov 1966'. The drifts at Calow Main were fabricated in brick but succumbed to the rigours of time and by the 1970’s they were in a poor state of repair. An action of much interest to miners in the county was heard yesterday when William Crompton of Bole Hill Cottage Calow a checkweighman sued J. G. Smith Birdholme, Herbert Hopkinson Boythorpe Lane and Ernest Harvey Bonds Main, President, treasurer and secretary of Bonds Main Checkweigh Fund, for £11 – 12- 6d as wages due to him as checkweighman at the Calow / Bonds Main collieries and 5/- per day for five weeks plus 55%. He claimed this sum from the defendants as damages sustained by him in being prevented from performing his duties. In September 1907 the Staveley Company gave notice to the men at Calow pit to terminate their position with the Company in 14 days. This was in consequence of the Company having “headed” through their Bonds Main pit to the workings at Calow pit thus making the two pits into one. 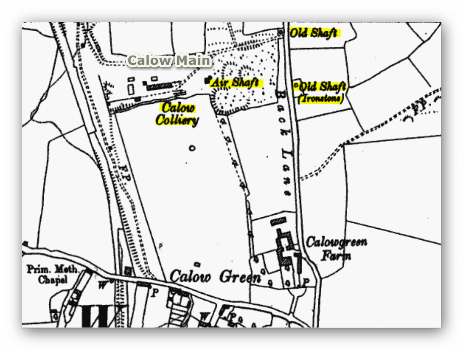 At the termination of this notice the men at Calow continued to work at the colliery. Crompton had been checkweighman at the pit for 5 years. At the time 667 men were working there. At the ballot Crompton 349 and Swift 277. In accordance with the act notice was sent to Mr. Cuthbertson, General Manager. On the site of the colliery one of the drifts is capped off and an inscription included, scratched in the cement block which reads 'Mine Shaft Capped 2nd Nov 1966'.